Today I'll show you how to Transform the Stampin'Up! Sweet Cup into an Easter Basket! Take a look! The sweet cup does most of the work for you--usually trying to construct a round box or basket is a bit tricky--when I looked at the Sweet Cups the first time I thought they would make an amazingly cute Easter basket with minimal work. EAch pack of cups contain 10--great price! I'll give you the directions below and following that will be the supply list. Click on the Shop Now button or on one of the product images and you'll be in my store to order the supplies you need to create these cuties. 1. 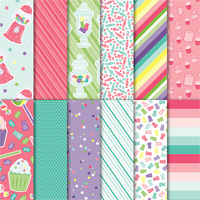 You'll need to sacrifice one of the Sweet Cups to get a pattern for the designer paper. Very carefully open up the side seam of one cup and cut out the bottom (you may want to save this in case you need it for a pattern for another project). What is left is the side of the cup--lay this out on the Butterfly Gala designer series paper (I used the tiny butterfly design). 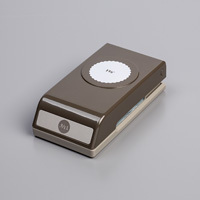 Trace the patter onto the DSP with a pencil and cut out with your Paper Snips. Attach this to the base of another Sweet Cup using Tear & Tape (Item #138995). 2. 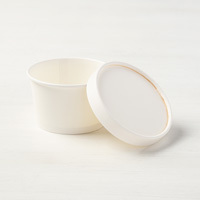 With your Paper Snips cut out the top of one Sweet Cup lid...use the tips of the scissors. Then set the lid rim (what is left after cutting out the top) on top of the decorated cup. 3. Attach approximately 22" Calypso satin ribbon to the rim with Tear & Tape. 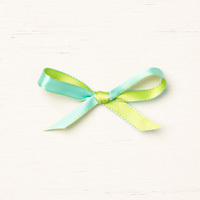 Tie a bow with the two ribbon ends. 4. Cut 3/4 X 11" thick Very Vanilla cardstock; using 11" Calypso Coral cardstock and the Decorative Ribbon punch--punch the ribbon and adhere it to the vanilla piece with liquid glue. Add liquid glue to about 2" on the good side of this "handle" and stick it inside the cup (let this dry a few minutes before trying to hold the basket by the handle). Your basket is ready for the sweets! Enjoy! *If you place an online order and use this month's Host code (6ESMM4AR) you will receive $5 in Stampin'Up! product for each $50 in product that you purchase. Supply List: Click on one of the product images below and you'll be shopping in my store--order your supplies today! Painted Seasons Bundle - Take 2! We're creating another awesome card with Painted Seasons Bundle - Take 2! I'll give you the directions for this card and following that the supply list to create this card. 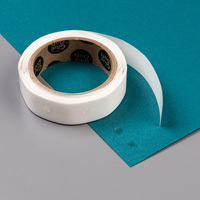 Order your supplies by clicking on the Shop Now button or on one of the product images below. *Sale-a-bration is on until March 31st--for each $50 (or $100) you purchase in products you can select a Sale-a-bration freebie. *If you place an order online and use this month's host code (6ESMM4AR) you'll receive $5 in Stampin'Up! product for each $50 in product that you purchase. Adhere under the flower with glue. Your card is ready for sending! Enjoy! Supply list: Order your supplies now by clicking on one of the images below. Today we're creating with the new Sale-a-bration freebie, Painted Seasons Bundle Plus a Bonus. We have 3 new Sale-a-bration freebies (effective now)--you can download the complete brochure here Download 20190215_SAB19-2_en-US. The Painted Seasons Bundle is awesome with the new stamp set and the gorgeous Designer Series Paper to coordinate (this is a $100 reward). 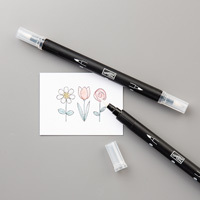 There is a bonus product coming for sale March 1st (and it will only be available during March as far as we know)---it's a set of framelits that coordinate with the Painted Seasons bundle. I love the way we can mix and match the paper and stamps to get some really fun quick and easy creations. 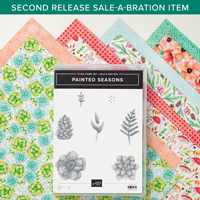 It's here--New Sale-a-bration product - Painted Seasons Designer Series Paper! 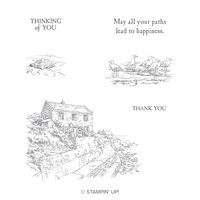 Plus there's a lovely stamp set that coordinates with it and forms a bundle! This designer paper you can see has some really gorgeous designs...my fav is the floral pattern which you can see in this card---it's so lovely that I don't want to cover it up--so I use just a small greeting to let all its beauty show through. And...remember---March 1st - 31st we will have some brand new products that you can purchase--that coordinate with the Sale-a-bration freebies...that brochure is downloadable here Download 03.01.19_FLYER_Q1_OOP_US--these products also are only available for sale for the month of March or as long as supplies last. I'll give you the directions for the card followed by the Supply List. Click on the Shop now button or on one of the product images below & you'll be in my store. Order your supplies now before they run out of stock. *For each $50 in product that you purchase you can select a free item from the Sale-a-bration mini (beginning Friday 2/15 you can also select from the second product release). (Note: 3 items require a $100 purchase--the Painted Season bundle is a $100 free item). 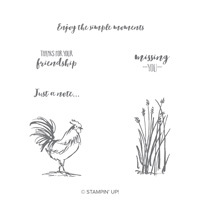 *If you place an online order and use this months' host code (6ESMM4AR) you'll receive $5 in Stampin'Up! product from me for each $50 in product that you purchase. 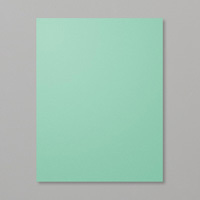 1.Cut Calypso cardstock 4 1/4 X 11, score the long side at 5 1/2 (card base). 2. Cut Early Espresso cardstock 3 5/8 X 4 7/8; adhere to card front with liquid glue. 3. 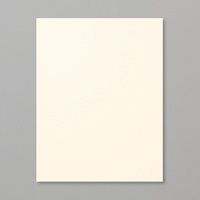 Cut designer paper (Painted Seasons) 3 1/2 X4 3/4; adhere to card front with liquid glue. 4. 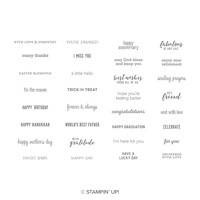 Stamp "For Your Birthday" in Stazon Jet Black ink on Petal Pink cardstock (item #146985); punch out with 1 1/2 circle punch. Attach to card front with dimensionals. 5. 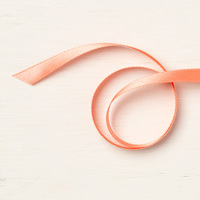 Tie a 9" piece of Calypso Coral ribbon in a bow and glue dot above the sentiment. Adhere a Frosted Flower below the sentiment on the circle. 6. Use Wink of Stella on the darkest flowers to sparkle it up a bit! 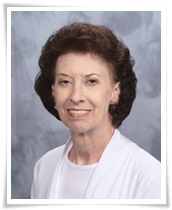 Your card is ready for sending. 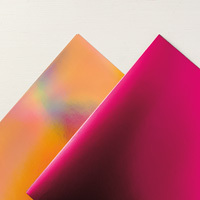 One caution using these dynamic embossing folders (the thick ones with the deep impressions) ---treat your foil gently--it can cause slight splits in the foil--if it happens, take a sponge dauber and some Lovely Lipstick ink and just touched those splits up a bit --- good as new. 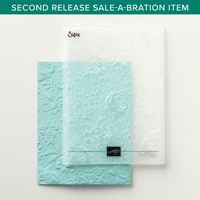 Both wonderful products (foil & folder) are FREE..the foil is part of the first release of Sale-a-bration free items & the Country Floral embossing folder is part of the second release that becomes available Friday February 15th---while supplies last! This last statement is probably the most important part of this post! This is so beautiful that it will fly off the shelves & I expect supplies to run short very very quickly--just sayin'! 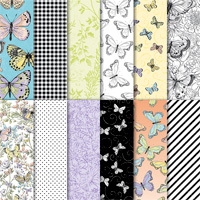 Tune in Friday to see the fabulous Designer Series paper....to die for! And...another bit of news---March 1st - 31st we will have some brand new products that you can purchase--that coordinate with the Sale-a-bration freebies...that brochure is downloadable here Download 03.01.19_FLYER_Q1_OOP_US--these products also are only available for sale for the month of March or as long as supplies last. *For each $50 in product that you purchase you can select a free item from the Sale-a-bration mini (beginning Friday 2/15 you can also select from the second product release). (Note: 3 items require a $100 purchase). 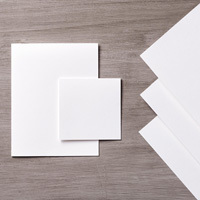 1.Cut Thick Whisper White cardstock 4 1/4 X 11, score the long side at 5 1/2 (card base). 2. Cut Basic Black cardstock 4 X 5 1/4; adhere to card front with liquid glue. 3. 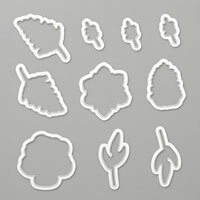 Cut Lipstick Foil 3 7/8 X 5 1/8; dry emboss with Country Floral embossing folder. 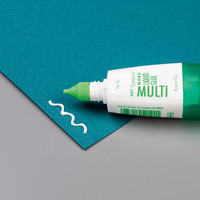 Adhere to card front with liquid glue. 4. 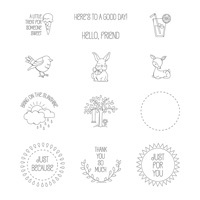 Stamp "Just Because" in Stazon Jet Black ink on Whisper White cardstock; punch out with 1 3/8 scalloped circle punch. 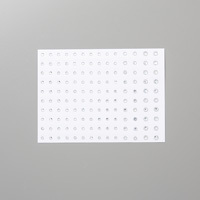 Punch Basic Black cardstock with 1 1/2 circle punch. 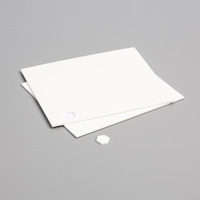 Adhere circles together with liquid glue--attach to card front with dimesionals. 5. 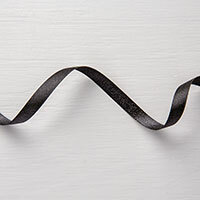 Tie a 14" piece of Shimmer Black ribbon around card stock and tie in a knot above the sentiment. 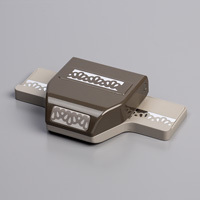 Today I'm going to show you an awesome product---It's Coming Next Friday! 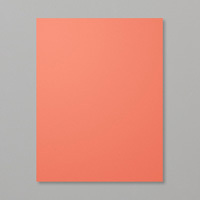 Here's a card created with it.....see that totally terrific embossed cardstock! 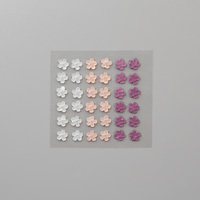 This folder is a dynamic embossing folder (one of the thick ones) called Country Floral...and you cannot buy it! Nooooo, but you can get it for FREE! That's right, it's a Sale-a-bration freebie!! 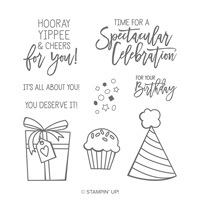 It becomes available February 15th...when you purchase $50 in Stampin'Up! product you can select a freebie....and this is one of the new ones! You are getting a sneak peak. Here's a close up so that you can really see the detail in this folder...is it not gorgeous? It is so pretty that I didn't want to cover up the design---that's why I used a small greeting (Itty Bitty Greetings) so we could see more of this beautiful design. 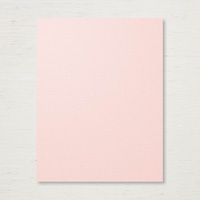 I'll give you the simple directions to create this card followed by the Supply list...click on the Shop Now button or on one of the product images below and you'll be in my store. *Place your online order and use this month's Host code (6ESMM4AR) and for each $50 you purchase in product, I"ll give you $5 in Stampin'UP! product. *For every 4 SAB freebies that you earn you'll receive a box of chocolates plus a $5 certificate. 2. 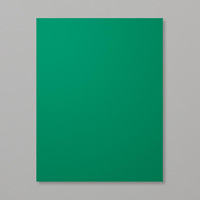 Cut Basic Black cardstock 5 1/8 X 3 7/8; adhere to card front with liquid glue. 3. 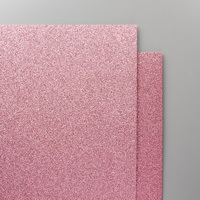 Cut Shimmery cardstock 5 X 3 3/4; run through Big Shot in Country Floral folder. 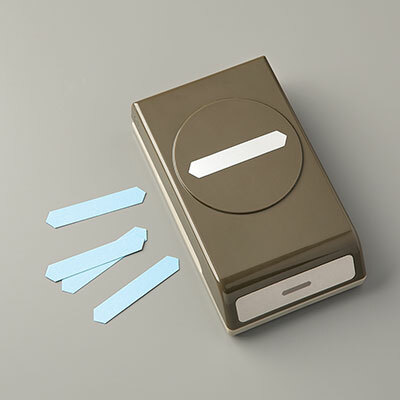 Adhere to card front with liquid glue. 4. 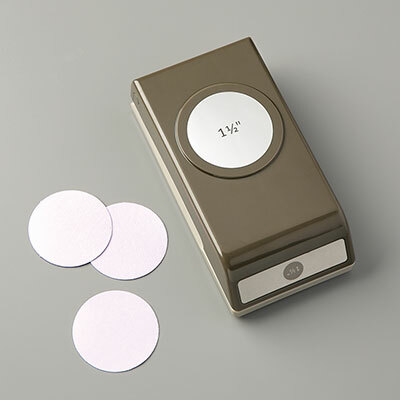 Stamp "happy mother's day" in Stazon Jet Black on Powder Pink cardstock; punch with Classic Label punch; adere to 1 1/2 X 1/2 Rose Glimmer paper with glue dots; adhere to card front with mini dimensionals. 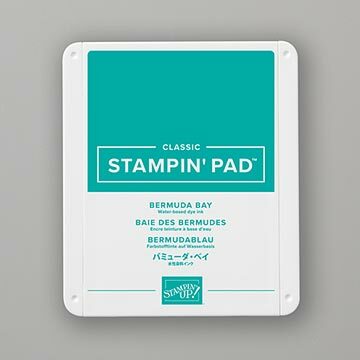 Today we're creating with By the Bay - a Sale-a-bration Stamp Set. Living in Maryland we have lots of Bay water in our area so this stamp set seems designed just for us! Since this is an SAB set this means you can get it free with a $50 purchase...pretty terrific, right? The coloring is minimal--I used the Watercolor pencils and smoothed out the color with the Blender Pens...quick, easy, and very effective. If you'd like to get a reminder when new posts are made--sign up for my email list---just click on the button and fill out the short form and you'll be notified each time I post a new project. I'll give you the simple directions to create this lovely card and following that I'll give you the supply list. Click on the Shop Now button or on one of the product images and you'll be in my store. Order your supplies to create this cutie. 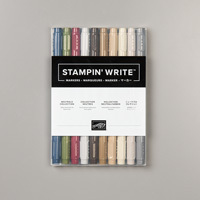 *For each $50 in product that you purchase you can select a FREE Sale-a-bration item from the SAB mini (click here to see the items Download 20190215_SAB19-2_en-US. *For each 4 SAB freebies that you earn from Stampin'Up!, you'll receive a hand-decorated box of chocolates from me with a $5 coupon! 2. Cut 4 X 5 1/4 Coastal polka dot DSP (How Sweet It Is); adhere to the card front with liquid glue. 3. 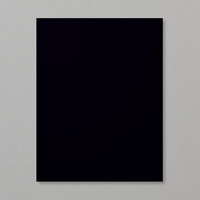 Cut Shimmery White cardstock 4 3/8 x 3 1/8; Stamp greeting (By the Bay) in Stazon Jet Black ink (itme #101406) in the upper part of the cardstock. Stamp 2 sandpiper images (side by side) in the lower part of the cardstock. 4. Using Watercolor pencils (Bermuda Bay & Early Espresso) color the images; blend the colors with Blender pens. Here's the supply list: Click on one of the images below and you'll be in my store--order your supplies now! Tuesday we created a lovely card with the wheat image and today we're doing Home to Roost - Take Two - using the main image of the rooster. Loving to color I selected the Water color pencils to color the rooster in...blending just a bit with the aqua painter...it doesn't take long to color and I used multiple colors on the tail---I had seen the done many years ago and loved the multi-color effect of it. *If you place your order online and use this month's host code (6ESMM4AR) you will receive $5 in Stampin'Up! product from me for each $50 in product that you purchase. 1. Cut Crumb Cake cardstock 8 1/2 X 5 1/2, score the long side at 4 1/4 (card base). 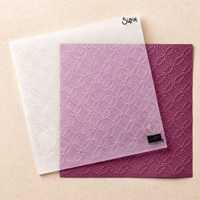 Use the Quilt Top dry embossing folder on the card front. 2. Cut Early Espresso cardstock 3 1/4 X 4 1/2; adhere to card front with liquid glue. 3. Cut Water color paper (item #122959); stamp rooster in Stazon Jet Black ink on the left side and the verse on the right side. 4. 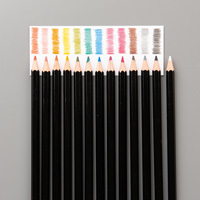 Use the following water color pencils to color: Early Expresso, Real Red, Pumpkin Pie, Daffodil Delight, Cajun Craze, Old Olive. 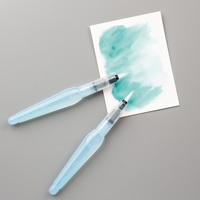 Use the acqua painter to blend the pencil slightly. (If you like Wink of Stella--use it on the head and tail (Item # 141897). 5. 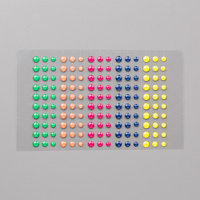 Add Happiness Blooms Enamel Dots above the verse in a rough triangle.